I haven’t actually included any anthologies in my reprints so far, even though I have reviewed an awful lot of them. So I thought I should include one today. This review of Nebula Awards Showcase 2004 edited by Vonda N. McIntyre was, I think, written for The New York Review of Science Fiction, but I can’t find a record of it being published. So this may be its first appearance. In 1966, the newly-formed Science Fiction Writers of America, as it was then called, initiated a set of awards. The Awards were to be called the Nebulas, and they were to rival the existing Hugo Awards because rather than being a popular vote among fans there were to be chosen by the people who were really supposed to know about the genre, the professional writers. They differed in another way also, because no sooner had the awards been presented than the winners and a fair selection of the runners-up appeared in a special anthology, Nebula Award Stories, edited by Damon Knight, appropriately enough since Knight had been instrumental in setting up the SFWA and the Nebula Awards. By Nebula Award Stories 4, edited by Poul Anderson, the anthology had started to acquire additional critical material, in this instance ‘The Science Fiction Novel in 1968’ by Willis E. McNelly and an ‘In Memoriam’ for what seems to have been a particularly unfortunate year (among the dead were Mervyn Peake, Anthony Boucher, Arthur Sellings, Anna Kavan and Groff Conklin). The following year’s anthology does not have the obituaries though an ‘In Memoriam’ list includes Willy Ley and John Wyndham, but it does have ‘The SF Novel in 1969’ by Darko Suvin (featuring an early expression of his theory of ‘cognitive estrangement’) and a redundant-seeming ‘Short SF in 1969’ by Alexei Panshin. And so the pattern was set: year on year thereafter we’ve had members of what is now the Science Fiction and Fantasy Writers of America taking their turn to edit an anthology which has, in many ways, changed little since those early years. This year, for instance, ‘In Memoriam’ takes the form of seven short pieces on Damon Knight. Given that the organization, the awards, and by extension this anthology would not be here without him, this is only right and proper. Nevertheless, did we need to be told the story of how he trashed A.E. Van Vogt’s The World of Null-A three times? There are fitting memorials – as the pieces by Frederik Pohl and Lesley What, for example, clearly are – and there is flabby overload because someone, somewhere has decided that all these various pieces should not be edited, or cannot be omitted. Considering that we here are remembering one of the finest editors the field has produced, that does not seem to be honouring his memory particularly well. Somewhere along the line the ‘Novels of the Year’ piece has transmogrified into an extract from the winning novel. This is an interesting taster for those who might not have caught up with the book in question (this time around it’s American Gods by Neil Gaiman), even if a self-contained piece of a little over five pages can hardly be said to do justice to the complete work, and speaking personally I do miss the round-up article. Curiously, in 1999 a fifth category was added to the Nebulas alongside best novel, novella, novelette and short story: best script. Except for the complete shortlist, and the list of past winners, which appear at the back of the book, you wouldn’t know this. There is no extract from the winning script (in this instance, The Lord of the Rings: The Fellowship of the Ring by Fran Walsh, Philippa Boyens and Peter Jackson), nor is there a round-up of the year on film or television, nor is there any mention of this work anywhere else in the book. The Nebula that time forgot? Back in the mid-70s the SFWA briefly awarded a Dramatic Presentation Nebula, but it was quickly and quietly forgotten; one wonders if the Best Script is destined to go the same way. Speaking of extraneous awards, the SFFWA has also taken to announcing a number of other honours on a seemingly ad hoc basis. This time around we get a Grand Master (Ursula K. Le Guin) and an Author Emeritus (Katherine MacLean – a writer who is certainly worthy of recognition, though I have severe doubts about what is, if you will pardon the term, a very nebulous award). Each, therefore, features in this volume with an appreciation and a sample of their work. Ursula Le Guin is memorialized by Molly Gloss who does a stolid if unspectacular job, and is represented by a couple of pieces from her recent volume Changing Planes, which may not show Le Guin exactly at her best, but is pretty close. Katherine MacLean, alas, gets Sharon Lee, who seems to tell us rather more about Sharon Lee than she does about ‘Katie’ MacLean, and is represented by ‘Games’, not her best story, and which does rather show its age (it was first published in 1953). And after all that we get to the meat of the book, the stories which made the final ballot for the 2002 Nebula Awards. This is where the current volume most resembles its mid-60s ancestors, and most differs from them. It resembles them in containing the three short-fiction award winners – novella: ‘Bronte’s Egg’ by Richard Chwedyk; novelette: ‘Hell is the Absence of God’ by Ted Chiang; short story: ‘Creature’ by Carol Emshwiller – along with one of the shortlisted novellas, one of the shortlisted novelettes and three of the shortlisted short stories. In other words, in this fairly superficial way, it is pretty much the mixture as ever. In more fundamental ways it is very different. For a start, the Nebula Awards can no longer be said to represent the best stories of the year. In Nebula Award Stories Number Two edited by Brian W. Aldiss and Harry Harrison, for instance, every one of the eleven featured stories was first published in 1966. 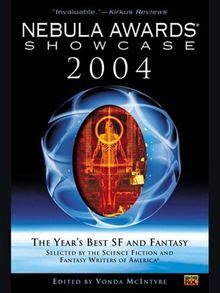 In Nebula Awards Showcase 2004, on the other hand, the shortlisted works had original publication dates ranging from March 2001 to September 2002, an incredible spread for what is supposedly the best of the year. In other words the criteria for qualification has been hugely expanded, not only in terms of genre (science fiction and fantasy) but also in terms of chronology (effectively a qualification period of not much less than two years). Simply by counting up the ‘Honourable Mentions’ in the annual Dozois or Datlow and Windling Year’s Best anthologies we can work out that even in one calendar year there’s a massive gene pool to draw from; so the tiny selection in each volume must be the best of the best. In which case – and this is the most startling difference of all – why, with a couple of more than honourable exceptions, do the stories gathered here seem so unmemorable? Comparisons are odious, and it is worth noting that no award is an absolute guide for what will endure. Each of the Nebula anthologies I’ve looked at contains at least one or two stories that have quietly disappeared from view (‘In the Imagicon’ by George Henry Smith, for instance, in volume 2, or ‘Mirror of Ice’ by Gary Wright in volume 3). Nevertheless, they also contain stories that regularly appear in anthologies of science fiction even today (in those same two volumes, and ignoring the actual winners, there’s ‘Light of Other Days’ by Bob Shaw and ‘Pretty Maggie Moneyeyes’ by Harlan Ellison). Somehow, with the exception of the Chiang and just possibly the Emshwiller, I can’t honestly see any of the stories gathered here keeping the anthologists in business for decades to come. This is partly because the overwhelming mood in this collection is one of nostalgia. These are not stories that look forward, that celebrate or explore or challenge the new; quite the opposite, they are predominantly looking back at the sort of science fiction that used to excite the authors. And yes, they are that self-referential. The most blatant example of this, and the most tired story in the whole book, is ‘Sunday Night Yams at Minnie and Earl’s’ by Adam-Troy Castro. An old man returns to the moon where he worked as a pioneer and where he had a strange experience which changed his life: in common with his fellow workers, he spent time with Minnie and Earl, a comfortable old couple who lived in an archetypal mid-Western house sited impossibly in the middle of the lunar wilderness. The working life is presented with the sort of gritty realism we’ve been seeing in the stories of Allen Steele and Jerry Oltion (a dedicatee of this tale) for years, while Minnie and Earl go straight back to Ray Bradbury (who appears in a photograph in their sitting room). The whole point of the novella is that it is about what science fiction used to be. It is told with a smooth competence if no great originality, but the only possible excuse for it appearing on the Nebula ballot (ignoring the possibility that everything else published during the two years in question was unspeakably bad) is a longing for how things used to be. If nothing else in this collection is so blatantly old-fashioned, you still get that sense of looking back in the extract from American Gods; in Michael Swanwick’s short story, ‘The Dog Said Bow-Wow’ (an over-familiar tale of a pair of confidence tricksters out to rip off a British royal family decked out with ancient titles, archaic uniforms and antique rituals; despite the fact that the glamorous rapscallion of a hero is a talking dog, this is a story all about looking backwards); and even in Charles Stross’s novelette ‘Lobsters’. This may seem a surprising assertion, isn’t Stross supposed to be the cutting edge, the modern hard-core? And isn’t this story all about surfing the wave-front of the future, as the cutting edge becomes the ragged edge of disaster? Well, yes; but all the referents in this tale of tomorrow’s businessman anticipating the zeitgeist, the human/computer interface, the slick glamour of technology, even the harnessing of animals for data processing take us directly back to what William Gibson and his confreres were doing twenty years ago. And wherever Stross tries to take us beyond the cyberpunk model the story collapses into chaos. It is sharp, slick and well done, but it is at its best where it is most dated. Although dated, the Stross story is not safe. But that is not a thing you could say about ‘Bronte’s Egg’, Chwedyk’s award-winning novella is cosy, cute and as safe as they come. This story of toy dinosaurs that have somehow come to life, and how they look after an egg magically produced by one of their number, is basically a tale of a bunch of orphans in a home kitted out with kapok and pastel colours. There are all the clichés, the wise older heads, the withdrawn ones, the damaged ones, the hyperactive one with the over-ripe imagination who isn’t believed when he’s telling the truth. It is tricked out with a few science-fictional gewgaws, but it does nothing essential or interesting with them, and it beggars belief that this actually won any sort of award. From one cuddly dinosaur to another, Carol Emshwiller’s ‘Creature’ pulls many of the same strings as Chwedyk, but does so more economically, more potently and demonstrates why one deserves an award while the other doesn’t. An old man, still not over the death of his wife ten years before, has retreated to a snow-bound cottage in a remote landscape as bleak as the inside of his soul. There he encounters a dinosaur, a creature genetically designed as a weapon in the on-going war being waged somewhere in the background. The dinosaur is huge, but it behaves pretty much like a pet dog, and the empathy it awakens in the man during their hopeless flight from their military pursuers is the emotional heart of this story. It is this heart that raises Emshwiller’s story so far above Chwedyk’s cute but passionless tale. Two other stories can be dealt with fairly briefly before we move on to the undoubted star of this collection. ‘Nothing ever Happens in Rock City’ by Jack McDevitt contains most of its story in the title: a garrulous, gossipy narrator chatters his way around Rock City and in the interstices of what he says we glimpse the fact that something big is happening at the observatory on the outside of town, but he notices nothing. It’s a clever little idea delivered in less than four pages (it couldn’t sustain more than that), and there is nothing essentially science fictional about it at all. I like it, I just have no idea why it is here. Likewise ‘Cut’ by Megan Lindholm is a neat idea, a working-out of the arguments pro and con female circumcision as a new fashion among Western girls, which stops the moment the idea is in danger of turning into an actual story. You cannot fault the principles behind the piece, but a little drama wouldn’t have gone amiss. What Lindholm doesn’t manage to pull off in ‘Cut’ is what makes Ted Chiang’s ‘Hell is the Absence of God’ such a powerful story. He takes an idea, rationally explores its ramifications then (and here’s the trick that Lindholm misses) turns those ramifications into story. It’s a model he’s followed in practically all his stories, and can often, as here, lead to work that is more intellectually than emotionally appealing. But it is a feast for the intellect, in a way that the early Nebula anthologies suggest science fiction used to be, but which the rest of this particular anthology suggests it no longer is. Imagine a world in which God and the angels exist, in which miracles happen, in which faith and adoration are demanded; then imagine that the beneficence of God is dispensed as randomly and as inexplicably as in any other world. Now work out the ramifications if you can see your lover ascend into heaven but know that you are condemned to hell. That is the starting point for this excellent story. It is as far from cosy, as far from safe, as far from self-reference, as far from nostalgia as it is possible to be. Which is why this is the one story here that really does deserve to stand alongside the great Nebula winners of the past.